Martin Rico y Ortega was born on November 12, 1833 in Madrid during a time of prolonged civil strife in Spain. Conflict between reformers and authoritarian factions in the royal family and the government produced not only civil war in the 1830s and 40s, but also continuing economic uncertainty well into the last decades of the century. 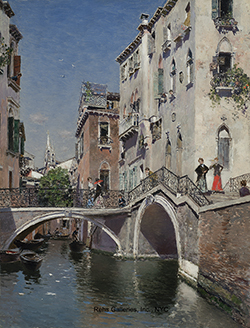 Perhaps because of this social upheaval, Rico y Ortega’s career as a painter flourished outside of Spain, first in Paris and later in Venice. He was part of a generation of young artists who gravitated toward Paris at mid-century, pioneering the path that would subsequently be followed by Pablo Picasso, Juan Gris, Joan Miró and Salvador Dali, among others. The young Rico y Ortega received his earliest art education from his brother Bernardino Rico, who worked as an engraver. He then attended the Escuela de Bellas Artes de San Fernando in Madrid where he studied landscape painting with Jenaro Pérez Villaamil. As the first professor of landscape painting at the Academy, Pérez Villaamil was deeply influenced by English artists such as John Constable; and likewise, his students absorbed the habit of painting on site and striving to capture the atmospheric conditions of clouds, water and light. During his student years, Rico y Ortego was also influenced by Juan Antonio de Ribera, a pupil of Jacques-Louis David and later the Director of the Prado Museum; and by Federico de Madrazo, who had studied in both Paris and Rome, and regularly exhibited his work at the Paris Salons. These connections would later serve Rico y Ortega well in his career, including introducing him to Mariano Fortuny who was Madrazo’s son-in-law. 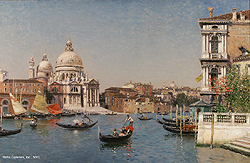 Back home in Paris, he turned his attention to developing his own stylistic vocabulary and creating a reputation as a distinctive landscape painter. He first exhibited at the Paris Salon in 1864, winning a prestigious silver medal in 1866. During this early period, Rico y Ortega’s work reflected the plein-air approach of the Barbizon painters as well as the Realists’ emphasis on depictions of everyday life. Washerwomen of Varenne, (1865, Prado), illustrates this clearly; in this strikingly horizontal composition, a large group of women toil silently at their laundry on the banks of the Seine while the skyline of Paris defines the panoramic view of the distance. Although the bright silver tonality creates a somewhat idealized image, there is no mistaking the arduous nature of the women’s work. Rico y Ortega continued to show his work at the annual Paris Salon, and later, at the Salon des Artistes Français. Although he returned to Spain during the Franco-Prussian War of 1870-71, he was back in Paris in time to exhibit seventeen new works at the Exposition Universelle in 1878. That year was especially significant for a bronze medal at the Exposition and, more importantly, the honor of being made a Chevalier of the Légion d’Honneur. Eleven years later at the 1889 Exposition Universelle, he again received a silver medal. Years of living in Paris and traveling through Europe gave Rico y Ortega a broad perspective on the aesthetic ideas of the time. In his 1878 View of Paris, (Prado) there are echoes of Impressionism in the short, vibrant brushstrokes and a fresh color palette, but there is also a suggestion of almost photographic realism that is more akin to the Naturalist aesthetic of artists like Jules Bastien-Lepage. Added to this are time-honored techniques common to both nineteenth-century panorama painters and eighteenth-century vedute artists, such as shifting the perspective of architectural elements for the most picturesque effect. Despite his peripatetic beginnings, Rico y Ortega settled permanently in Venice in the 1870s where he remained for the rest of his life. He had first visited the historic city in the 1860s, and then gradually began spending his summers there. Although little is known of Rico y Ortega’s personal life, putting down roots and establishing a home seems to have been important to the artist by the time he reached his mid-40s. The renowned light and atmospheric effects of the city had a profound effect on Rico y Ortega’s work as well. 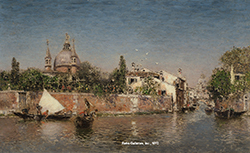 His cityscapes, replete with colored reflections in the canals, shimmer in the Venetian light, but there is also clarity of form that distinguishes these images from the misty depictions of other painters of Venetian scenes such as Félix Ziem or Pierre-Auguste Renoir. In the relative political calm of the late 1870s and 1880s, Rico y Ortega often visited his native Spain, exploring the landscapes of what had once been Moorish areas in particular. Images of the Alhambra buildings or the Guadaíra River illustrate the sharp, clear light of Andalusia, often with an almost photographic precision. Like many of his colleagues, especially in France, Rico y Ortega may well have been introduced to the use of photography as a tool for organizing a composition. During his later years, the painter also worked as the artistic director of the international journal Ilustración Española y Americana. This biweekly publication, founded by Abelardo Charles in 1869, presented a wide array of prints and drawings, thus making a critical contribution to the growing global market for art and design magazines. Rico y Ortega’s work also found an extensive market in the United States. For example, the collector William T. Walters of Baltimore was purchasing Gathering Oranges in Granada in the mid-1870s while the then new Metropolitan Museum in New York added A Spanish Garden to its collection in 1881. Similarly, the Prado Museum in Madrid was quick to accept at least five of Rico y Ortega’s paintings from donor Ramón de Errazu in 1904. 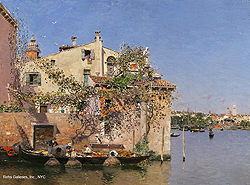 At the age of 74, with a lifetime of artistic success behind him, Martin Rico y Ortega died on April 13, 1908 in his adopted city of Venice. [i] These sketchbooks are located at the Hispanic Society of American Museum and Library, New York, NY.